Issued 22nd July 2018. 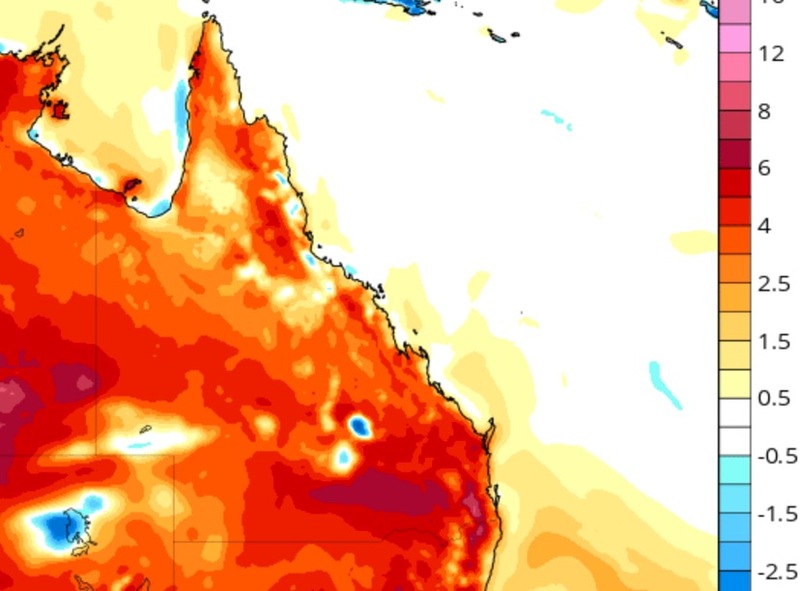 Maximum temperatures will warm up to above average across Queensland this week. Above image: temperature anomaly via Tropical Tidbits. Despite the recent run of cold frosty mornings across Southern and South East districts, daytime temperatures will become very warm across the state this week. Large parts of the state will climb to a very warm 25ºc or better with areas in the North West and Northern inland exceeding 30ºc. Southern and South East districts will also be warm with between 20 to 25ºc forecast. Brisbane is forecast to reach 25ºc on Tuesday which should last right through the rest of the week. Ipswich a degree warmer on 26ºc. These temperatures are around 5ºc above the July long term average. Both cities are running slightly above average for Winter so far… So much for the “record cold Winter” that other bloke from Brisbane Weather banged on about! Toowomba’s forecast of 21ºc all week is 5ºc above average as well. Longreach is expected to reach tops of 28 or 29ºc all the week which is 5 to 6ºc above the July average. Emerald, Rockhampton, Townsville and Cairns all going for max temps 26 to 27ºc. It will be very warm through North West and Northern inland parts of the state… Mt Isa, Cloncurry, Julia Creek, Richmond, Georgetown, Burketown and Normanton all excepted to reach or exceed 30ºc for most of the week which is 3 to 5ºc above average. A cold front is forecast to bring a cooler change to South West and Southern inland districts on Saturday and Sunday. Below image: 7 day QLD average maximums via Higgins Premium.